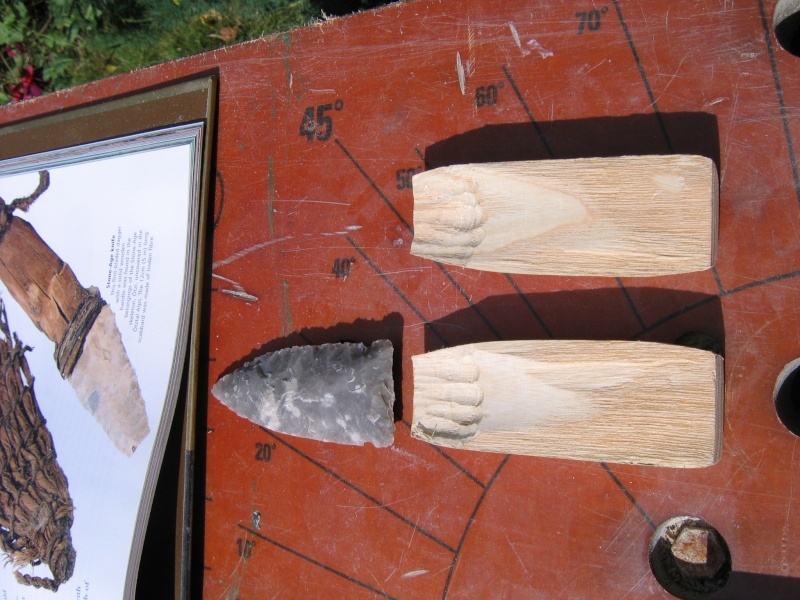 The two halves in the origional where stuck with pitch pine glue around the blade and bound both ends. I ended up using epoxy so the blade won't wriggle loose!
" 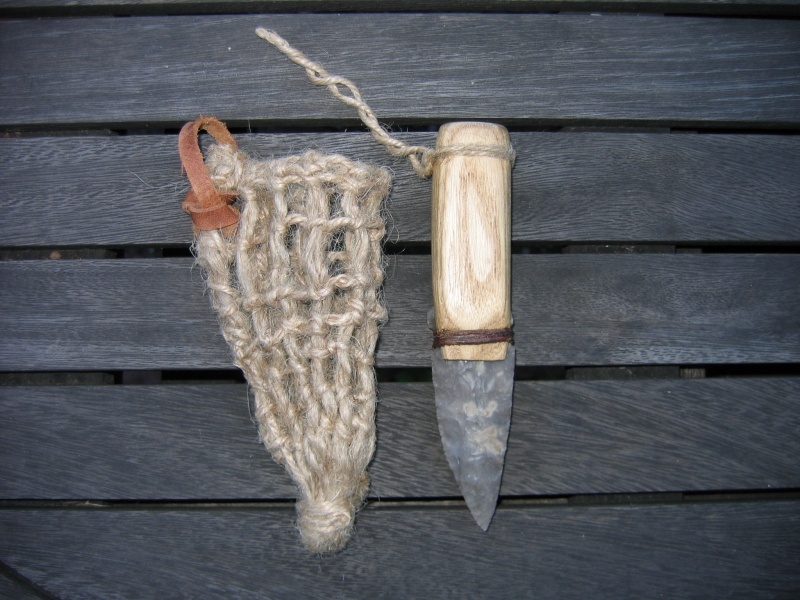 />Otzi's sheath was made of Lime bast, so I improvised with some of the Jute string, Will have to have another go at making this again as it ended a bit loose. That's really impressive. Do you have any dimensions on the knife and handle? Also all the jute I've found is pretty tightly wound, did you fluff it up? Yep, in a way. 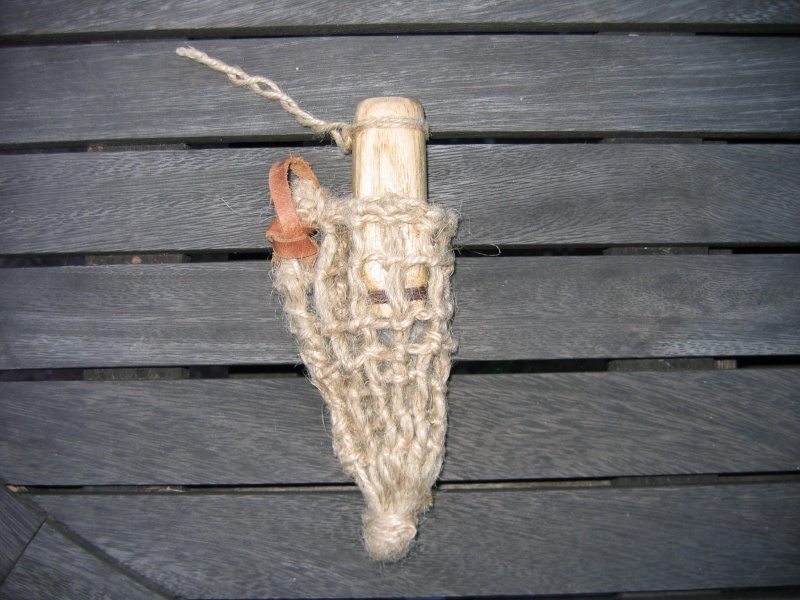 The threads running from the top to the bottom where split down from thick Jute string (4 ply down to 1) and the herizontal threads where knotted on to them using the thinner Jute string straight from the reel. Had to have a go, a bit more rustic in design than yours and I took your advice on the jute. Also why make one when you can make three. They look really good, It's a neat design indeed! Excellent - thanks for sharing the pictures. Grendel, I've got to ask but where do you get your sinue from? I have heard that sausage "skin" will work as well with a wash out before applying! 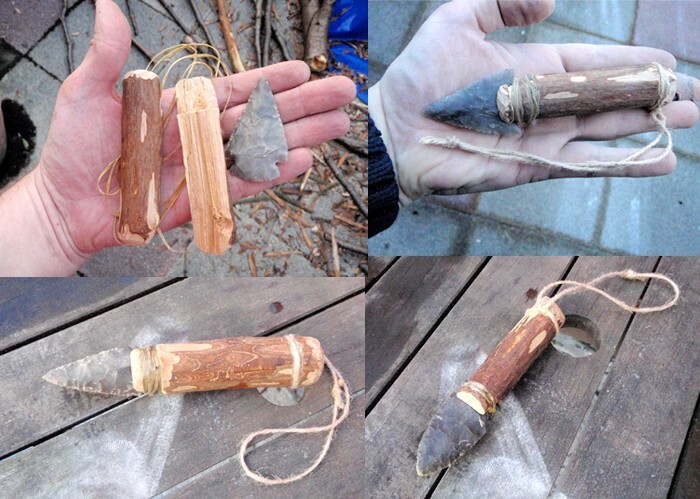 I get it off ebay, a simple sinew search will yield results for the imitation stuff. Occasionally the real stuff is there, you can then go to the sellers other items and some have websites/shops. Thanks Mr. G, will see what I can furtle. I have used the sinthetic sinue and it is good although it frays with little handling. Yet to try the real stuff... I did had some light bulb moments the last time I peeled a chorizo though. 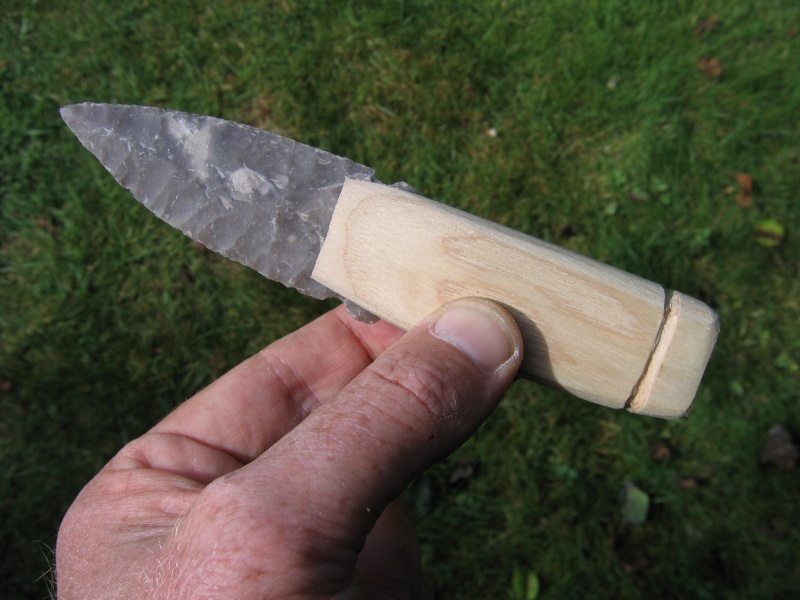 I liked the way the flint knife looked with the bark on, so I made a chunky Oetzi knife! The jute binding was singed and over painted with PVA glue to sort out the fluffyness. If you wanted to be more authentic you could use hide glue (gellatine!). That's a beautiful piece of parallel flaking on the blade. Pure luck, you should see the other side! It's not bad but a little uneven compaired to this side, its where the platforms fall... This was pressure flaked with the ishi stick with the thick steel nail tip. It's not very authentic as these things go. Absolutely stunning knife Mr Cone! Just a thought regarding the sinew. There must be thousands of old tennis rackets out there with 'cat gut' strings, which are sinew. Would this be any good? I'm quite interested in the plant in the background too. Is it a Musa basjoo or a Canna? Ta! I like the idea of recycling old tennis rackets, I'll see what I can find. As for the plant, I thought it was banana? It's one of the few things in the garden that are still looking healthy! Yes, the Japanese banana Musa basjoo. I have a large clump of them in my garden. Stunning plants with their six foot leaves, I used to get bunches of bananas most summers until a couple of years ago and we started to get really bad winters. From my time in SE Asia I learnt banana leaves are also very useful, apart from using them as plates, food to be steamed was wrapped in them and when grilling food it was placed on banana leaves, apparently they're a natural aromatic teflon.